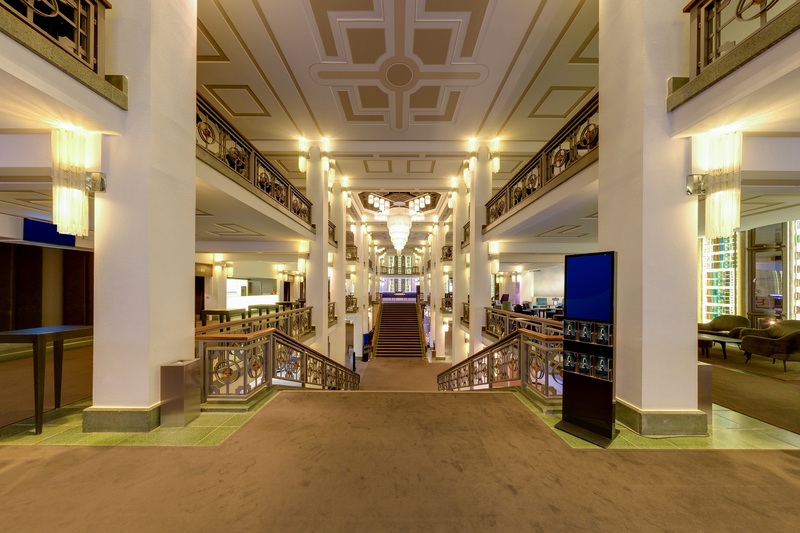 Virtual tour: Use your mouse or keyboard to take a look around the theater hall and foyer. Click on the numbers on the right-hand side to access the different levels at the Palast. There is nothing like it anywhere else in the world. Welcome to Berlin-Mitte – the centre of German politics, but also Berlin’s trendy nightlife. Nowhere in Germany will you find more theaters in such a small area. And in the midst of it is the world’s biggest theater stage! 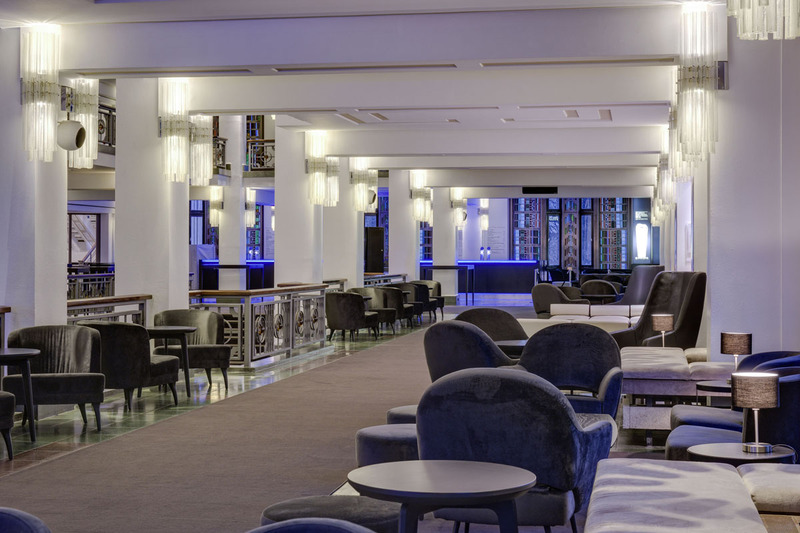 Reopened in 1984 and located at Friedrichstraße 107, the show palace lies in the district Berlin-Mitte just five minutes’ walk from Friedrichstraße railway station. The Palast is unique the world over for its diverse programme and sheer size. While the building does not seem so big from Friedrichstraße, looks are certainly deceiving: it is 80 metres wide, 110 metres long and covers an area of 195,000 cubic metres. The massive structure is the last major structure erected by the German Democratic Republic, making it an exceptional architectural testimony of the time before the Berlin Wall fell in 1989. Every year, our Grand Shows, children’s shows and guest appearances attract 700,000 visitors. Making the Palast by far the number one among the Berlin theaters. 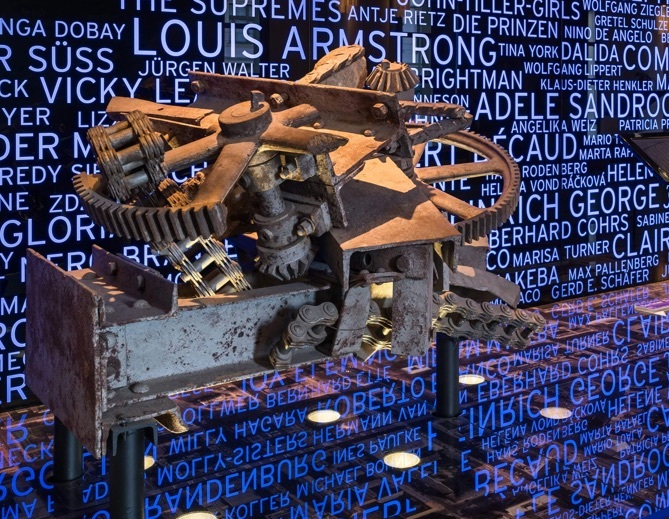 With more than 160 participants in every performance, including more than one hundred artists, it is also the largest ensuite show in the world. 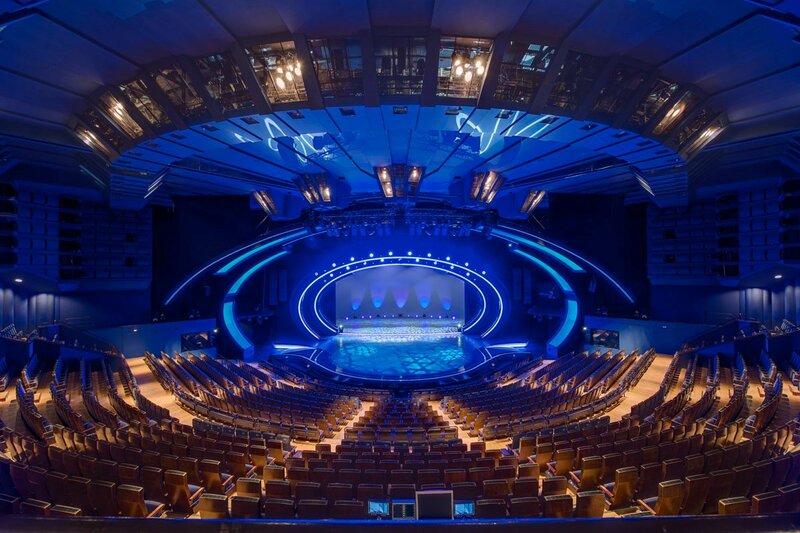 The main hall seats 1,899 and features main, side, front and back stages, a water basin and podiums. There is a total of 2,200 square metres of stage in addition to a further 700 square metres of further space featuring state-of-the-art technology for move around. The former Palast building that was demolished in 1985 was located close by, at ‘Am Zirkus 1’. Originally known as the Großes Schauspielhaus, it was opened by Max Reinhardt. 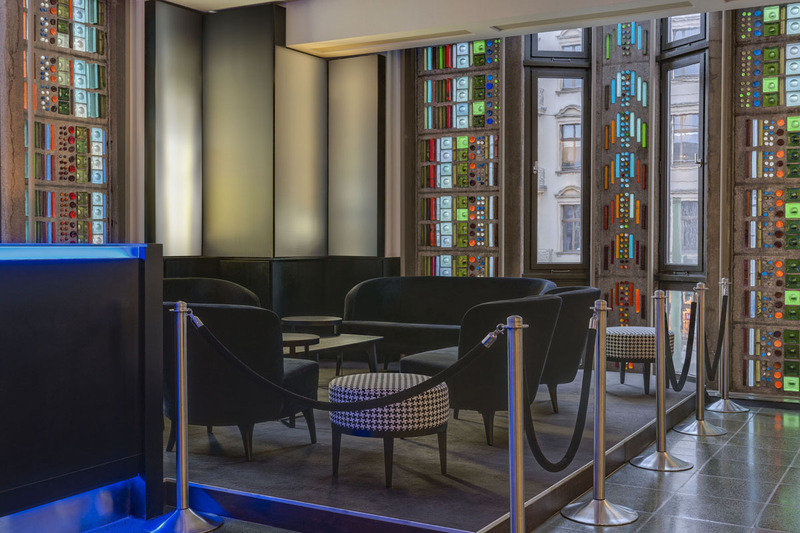 Today the new Palast has arrived in the twenty-first century. 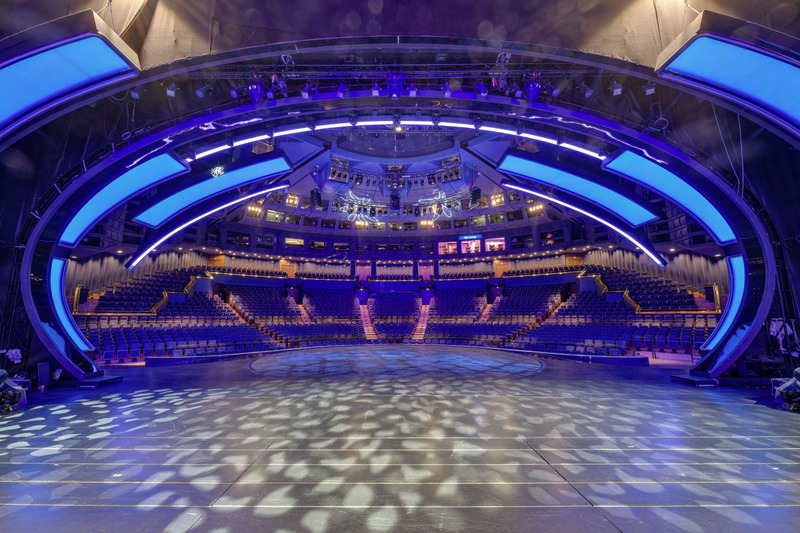 The Grand Shows offer state-of-the-art aesthetics and are packed with the latest high-tech effects. 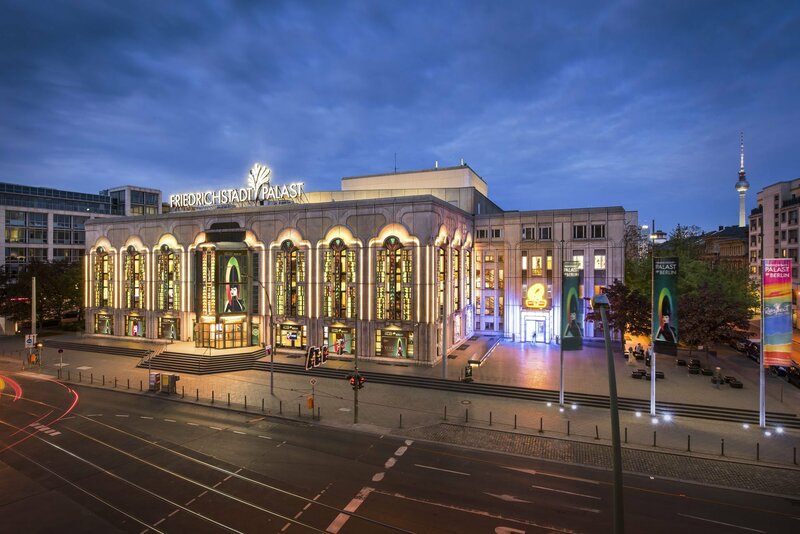 The Palast is renowned for its 60-person ballet group, 18-member show band, and Young Ensemble with 280 Berlin kids aged seven to 16. 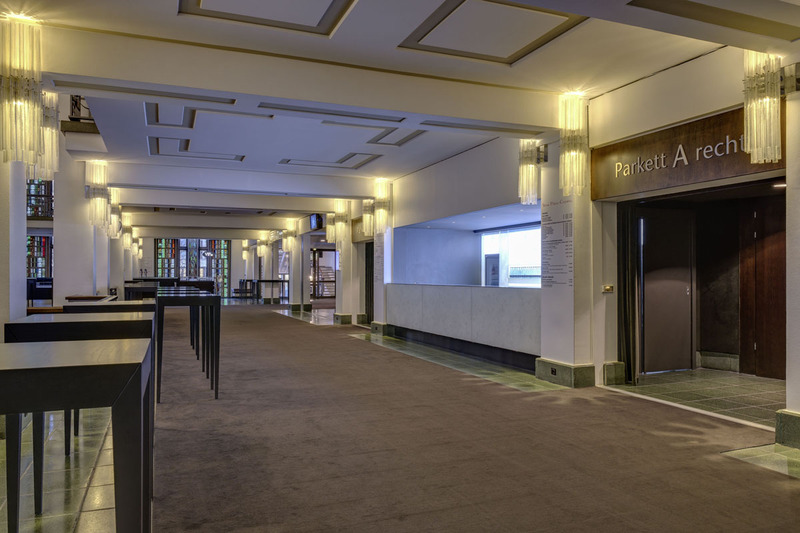 In February, the show palace is transformed into a film palace when it becomes the Berlinale’s biggest cinema. Opening in 1984 in the presence of the GDR head of state Erich Honecker, the grand art deco foyer is in the Socialist Postmodernism style. 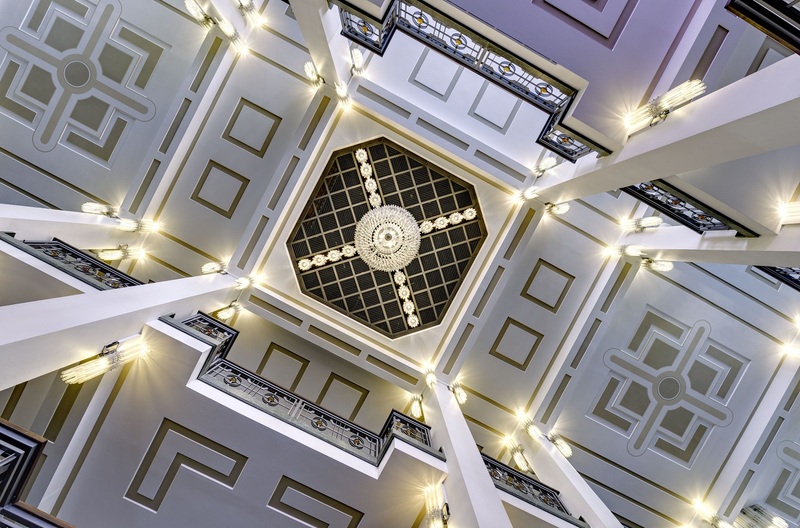 Interior view of the foyer ceiling. For a hundred years now, the theater has been known as Berlin’s number one address for big show entertainment. Max Reinhardt performed in the arena of what was then the Circus Schumann for the first time back in 1910. At the time, it was still housed in the building at Am Zirkus 1 on Schiffbauerdamm, which was originally intended as a market hall.